Insurance carriers to help “fill the gaps” that Medicare does not cover. This type of coverage is also referred as a “Medigap” plan. The beauty of a Medicare Supplement is that Medicare will remain your primary coverage which allows you to go to any doctor or hospital that accepts Medicare. Medicare will pay your medical expenses first, and then your Medicare Supplement will pay the remaining balance. Depending on which Medigap plan you choose, you may be responsible for some deductibles and or co-pays. 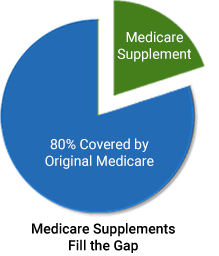 The plans that we get the most requests for quotes for are Medigap Plans F, G and N.
Medicare Supplement Plan F is one of the most popular supplements. It pays 100% of the costs that Medicare does not cover. This means that when you have Medicare supplement Plan F, you will not pay any deductibles or co-pays because the Plan F pays 100 percent! Medicare Supplement Plan G has becoming more and more popular because of affordability and benefits. It works exactly like Plan F, except for the Part B deductible. You are responsible for the Part B deductible each year, and after that, it pays everything else. In 2019, the Part B deductible is $185 per year. Medicare Supplement Plan N is one of the newer Medigap plans that was first offered in 2010. Plan N will usually have lower premiums than Plan F or Plan G. However you will have more cost sharing with Plan N. You will be responsible for your Part B deductible ($185 in 2019) and you will pay up to a $20 copay each time you see a doctor. You will pay a fee of up to $50 for an E.R. visit. You may also pay excess charges. Some doctors bill an extra 15% above Medicare’s rate. This is called an Excess Charge. Plan F or Plan G take care of this for you. With the Plan N, you pay the excess fee yourself.